Discussion in 'OS X Mavericks (10.9)' started by bwat47, Oct 7, 2013. The new memory management features are working extremely well!. I have a MBA with 4 gigs of ram. With mavericks it never touches swap, and it takes quite a lot of apps open to even make the memory compression go into effect. The cacheing seems very intelligent as well, the system always uses just under 4 gigs of ram and is very snappy when multitasking compared to lion, makes great use of all available memory. I'm very impressed with what they've done under the hood with this release. Safari also seems to take far less memory than safari 6 in ML. Safari 6 "safari web content" process often used 600+mb of ram for me with just a few tabs open. Safari 7 has more web content processes but they all use very little ram, and the overall usage is far less than safari 6. This release will be a must have for anyone with <8gb ram. 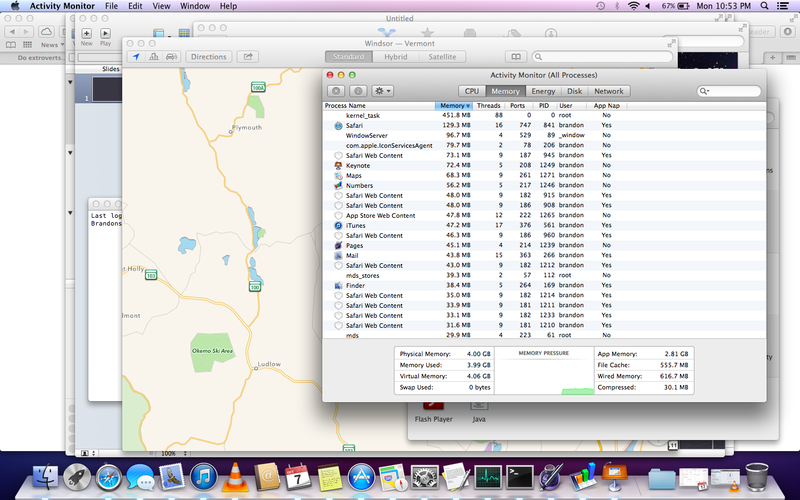 All these reports make me want to grab the GM and install it on my rMBP. Must. Wait. For. Public. Release. That is good to know! Mountain Lion essentially forced me to upgrade to 16GB RAM since it often had trouble releasing gigabytes of inactive memory, with as low as 12MB free memory left available which, in turn, initiated paging, slowing my system to a crawl. Yep, no more paging when there is no more free memory on maverick The memory compression doesn't seem to have any noticeable performance hit (or at the least not anywhere close to as noticeable as paging). I believe the enhanced memory manager is *the* killer feature of Mavericks. I upgraded my 2008 MacBook to Mavericks and it's been a pleasure so far. The new memory management features are working extremely well!. I have a MBA with 4 gigs of ram. With mavericks it never touches swap, and it takes quite a lot of apps open to even make the memory compression go into effect. While memory management is hugely improved, putting it about on par or slightly better than Snow Leopard, it isn't full proof. I have experienced in numerous occasions Mavericks tapping into swap memory even if there are significant file cache memory that could be reclaimed into inactive memory. is there any easy way to see free memory or page outs (not just swap used) in Mavericks? Mail.app, Safari, iMessage and iTunes. and a bunch of smaller ones that when added, takes up a bit of memory. Again, I have a good idea of which tasks should be running and tasks that were never in Mountain Lion. Fortunately, my Mac hasn't been sluggish and runs as quick if not faster than Mountain Lion but Mavericks seems to be memory hungry. I adore Mavericks. I installed it for Mari alone and its fantastic. Mavericks tries to use as much RAM as possible as intelligently as possible. You yourself said that it runs quicker than Mountain Lion. It isn't memory hungry if it's just using all your memory to maximum effect to make it run quicker. I don't know why you would worry about your memory being used up when you yourself said it was running faster than before. Just worry about the performance. Mavericks uses pretty much 3.8-4Gb of my 4Gb all the time, but it never touches swap and things run FAR better than before, that's how it's supposed to work. Its normal for kernel task to use that much ram. also its normal for mavericks to use almost all of your ram for cache (as it was for ML), the difference is that in mavericks, its better about releasing the "inactive" cache memory when an application needs it, and the memory compression feature allows it to avoid using swap in most cases, because instead of paging out to the hdd/ssd's swap it can simply compress the least used cached memory. Its much improved over ML's memory management. You don't really need to worry if most of your memory is being used, as long as you aren't getting a lot of swap usage and your system seems responsive. So far in mavericks its been very responsive with many apps open, even when I have no "free" memory, and even then I have yet to see it use any swap,it just compresses memory as it needs to. I hated when I moved around a large number of files in Mountain Lion, it would start using swap memory. I hope this no longer happens with Mavericks. I would go as far as saying it's the only reason justifying the upgrade. I forgot to add that I do get swaps. As for kernel_task, I know it can get that high in terms of memory use but in Mountain Lion, it wouldn't stay high, it would adjust. As for actual memory use, yes, memory is there to use but if you're talking about actual management, it should adjust/free memory when it isn't in use. Again fortunately, I haven't had any hiccups (spinning wheel) but this thread is about actual memory management and not performance (ex. Safari not releasing memory, terrible memory management but I don't think there were any performance issues, it just used up a lot of RAM) IIRC, questions relating to memory usage was the same for Lion and Mountain Lion and they were eventually fixed with updates which I don't doubt will happen with Mavericks. EDIT: Speaking of Safari, com.apple.webkit task doesn't end all the time even if after closing Safari completely. It's things like this I'm experiencing. Otherwise, solid OS for a .0 release. The battery life is killer as well, gained an hour here. They made a lot of huge improvements under the hood. I was thinking the same thing. At least an hour gain for my MBPR. Memory management is better. You can tell it's an overall smoother ride. As for actual memory use, yes, memory is there to use but if you're talking about actual management, it should adjust/free memory when it isn't in use. Again fortunately, I haven't had any hiccups (spinning wheel) but this thread is about actual memory management and not performance (ex. Safari not releasing memory, terrible memory management but I don't think there were any performance issues, it just used up a lot of RAM). You really need to know more about memory management before posting things like this. Memory management isn't just about keeping memory management as low as possible. Instead, memory management is all about optimising memory usage to get the best overall performance. Before memory compression, this meant the system should always have enough memory available to launch apps and tasks. If there isn't enough available when it needs it the system had to clear unnecessary memory on the fly or use the slow harddisk to temporarily store unused memory (swapping). This swapping is a serious bottleneck to all computer systems, and should be prevented at all cost. Therefore the system had to clear unused memory in advance before a task is launched. This is also why many people think they should keep memory usage as low as possible. Now with the coming of memory compression in Mavericks this all changed. Now, instead of writing unused memory to the disk the system simply uses one cpu-core to compress the memory on the fly. This process is much faster than writing it to the disk. Most of the time it is faster to just keep all unused memory and let the system decide what to do with it when it need to, instead of clearing it in advance because changes are that the system will need it again later. In fact, Mavericks even loads a lot more cache files into the memory in order to speed up the launching of tasks. And it works like a charm! Overall performance is way better in Mavericks than in Mountain Lion. So in Mavericks, memory usage doesn't say anything anymore. Instead the comes up with a new number called Memory Pressure. Memory pressure combines how much memory can be cleared with how much memory can be compressed and tells you how much tasks the system can handle before it needs to start swapping. In addition. Safari does use a lot of memory now. This is because it keeps the pages you have visited in memory so you can swipe back and forward through pages in an instant. It does this for all open tabs. I guess Safari might release the memory when it really needs to but only when memory pressure becomes really high and all cache files are already cleared from the memory and it can no longer compress more memory. But i'm not sure about this because I have no further insight in how Apple decided to prioritises it's processes etc. But like you said: I haven't experienced any slowdowns yet so apparently they did it right. And I agree with you and this is just the new way Apple is managing memory. I totally understand what you're saying and you're right but this behaviour was not the same as Mountain Lion where memory would be released if the application/task was not is use. This does not seem to be the case with Mavericks where memory seems to remain where they are but has a totally difference process on how it uses that memory. I still wish Apple would fix the Purge command already (it's broken in ML and still broken in Mavericks). I've had swap every time I used DVD Player, which still has not had the memory leak fixed. And the OS refuses to release the memory when needed after using that DVD Player. Nothing beats having to reboot just to have a usable system after watching a few episodes of your favorite shows. As for the memory compression, that isn't a new concept. Anybody that remembers the good ol' days of RAM Doubler will recognize some of the underpinings here. The main difference is that the compression is done by a free core, not by the primary core(s) currently in use (if available).